It&apos;s long been established that Spanish-language broadcasters are some of the most passionate and entertaining listens for fans of professional sports teams. Earlier this season, the Carolina Panthers&apos; Spanish-language crew went viral, shouting “Gano lo ganó!” after kicker Graham Gano&apos;s game-winning 63-yard field goal against the New York Giants. Philadelphia Eagles players celebrate after Chicago Bears kicker Cody Parkey misses a field goal in the final minute of their wild-card game on Sunday. An undrafted rookie who began the season on the practice squad kept the Philadelphia Eagles in the playoff race. Josh Adams helped the Eagles overcome deficits of 12-0 and 19-3 in a 25-22 victory over the New York Giants that moved the defending Super Bowl champions within one game of the Redskins and Cowboys in the mediocre NFC East. Coach Doug Pederson has been searching for an answer at running back since Jay Ajayi sustained a season-ending knee injury in October and veteran Darren Sproles injured his hamstring in Week 1. Of course a fourth-down conversion saved the Philadelphia Eagles’ disappointing season, at least for the time being. The Eagles have been able to replicate very little from their Super Bowl season, but coach Doug Pederson is still willing to go for it on fourth down. On fourth-and-1 with 2:39 left in a tie game against the New York Giants, Pederson left the offense on the field, as he famously did throughout last season on fourth downs. Sunday&apos;s NFC East matchup between the New York Giants and Philadelphia Eagles is a battle of two teams going in opposite directions. The Giants have won two games in a row after a miserable five-game losing streak earlier this season. New York improved to 3–7 with a 38–35 win over the Tampa Bay Buccaneers. On October 15, 1933, the Philadelphia Eagles, a team in its first year of existence, went to the Polo Grounds to take on the New York Giants. It did not go well: The Giants destroyed the Eagles 56-0, winning the first game between the two teams and starting what would be a longstanding trend of the Giants getting the better of their rivals. After a pair of tough losses, the Philadelphia Eagles rebounded with a dominant performance on the road against a division rival and dismissed talk of a Super Bowl hangover. The Eagles (3-3) are still frontrunners in the NFC East, and they&apos;re determined to make another long run. "Having let a couple games slip through our hands, and this is what I love about the team, the players don&apos;t panic," coach Doug Pederson said Friday. After five weeks of adequate performance, the team that captured Super Bowl LII took off the training wings last night and flew high over the New York Giants. 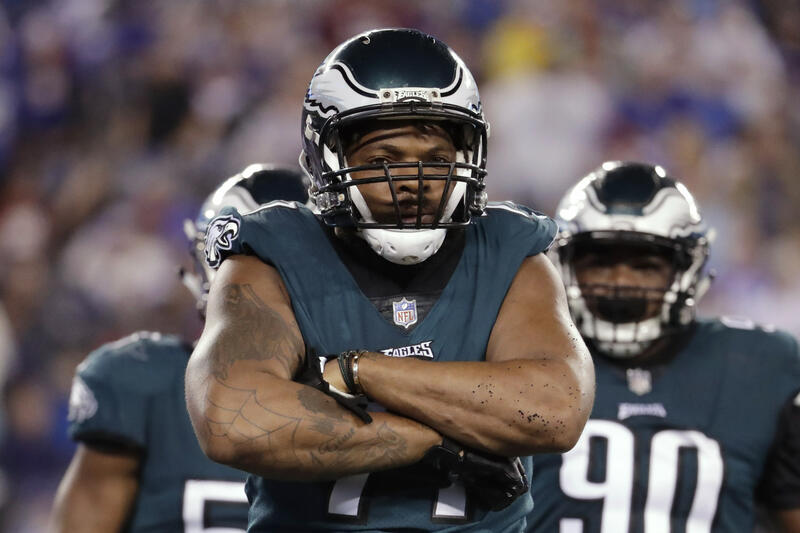 Taking down Eli Manning and crew at home 34-13 on Fox’s Thursday Night Football, the Philadelphia Eagles proved that they own the NFC East right now – and America’s attention, it turns out. Snaring a 10.8/19 in metered market results on the Rupert Murdoch owned net and NFL Network, last night’s TNF was a winner all round. The Philadelphia Eagles are finally starting to play like a defending Super Bowl champion. It took six games, but they sent a clear message to the rest of the NFL that they are going to make another run, if their game against the New York Giants on Thursday night was a sign of things to come. The Eagles (3-3) played fast, Carson Wentz spread the ball around and the defense - particularly the front four - made life miserable for Eli Manning and the Giants in a 34-13 win that enabled Philadelphia to avoid its first three-game losing streak since 2016.